This is the September 14, 2015 edition of Left Right and You! And, once again, Kurt Kozjarek and I provided the kind of insights into local politics that you just don’t get anywhere else starting with a complete explanation of the frivolity of Rob Russells impending lawsuit against the county. Though I still say my pre-monogrammed body bag giveaway is a great Idea that would actually save the Coroner money! 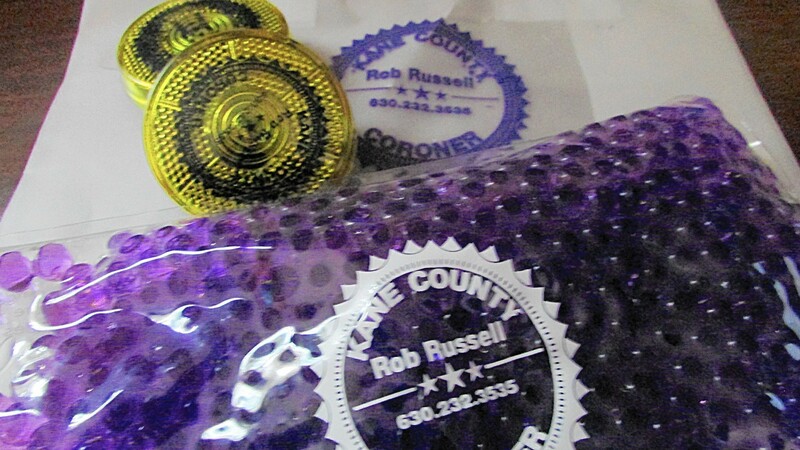 And by the way, the Coroner’s chachkies, pictured above, are not only a non-mandated expense, but a blatant attempt to campaign on the County’s dime. Every other countywide elected official simply gives away pens! We also discussed how the Hideway 64 and residents came together to make that restaurant resurgence happen as well as providing our thoughts on some of the newly announced local candidates. And we actually agreed on the merit of 65th District State Rep Steve Andersson. ← Coroner lawsuits, who’s running, The Hideaway gets their zoning, and more on Left, Right and You!